The Noakes Foundation has had a number of queries about the new various LCHF lists that have recently been released. As a Foundation we thought it best to reserve our thoughts and let Banters around the world decide for themselves whether or not they will switch from the existing lists to the new list variations. But due to the recent influx of requests for comment we realise that people often turn to Prof Noakes and The Noakes Foundation team for comment or validation when it comes to the low carb high-fat lifestyle. The Noakes Foundation is of the view that the LCHF lifestyle can be interpreted in a number of ways, and it’s implementation and effect can have varying effects depending on the individual, therefore it is important for each person to discover and decide for themselves what works and what doesn’t work. The new lists definitely offer more variety and take a more in-depth and comprehensive look into the various food groups and the effect on the body – some may appreciate this, and some may find it confusing. Again, it is up to the individual to decide what works best for them. Professor Noakes has not yet seen the new lists and therefore found it inappropriate to comment on them specifically, however he did mention that he was not involved in drawing up the original Real Meal Revolution lists, which were written by two of the co-authors Sally-Ann Creed and Jonno Proudfoot, both of whom have since developed their own understanding of the lists with some modifications. Professor Noakes does not see the lists as his area of expertise, although he does understand how important they are for successful weight loss. This is a view that The Noakes Foundation shares – let’s avoid getting caught up in the technicalities and rather focus on the basics of eating real, healthy, unprocessed foods. “To get it right, one doesn’t necessarily need to pay for a course, buy another book or look everywhere for more answers. We suggest getting a copy of the lists that you feel best suit your lifestyle, our suggestion being the original Green list from the original book Prof Noakes co-authored. Another great thing to do is join a free online support community and if you can afford it, there are many great online support programs and groups that one can also pay for extra support. However, none of these are crucial should you wish to make massive changes and get on the Bant-Wagon. Our focus as a Foundation is to educate the public and the medical sector in the right science in order to make the change simple, affordable and easy. We are committed to the whole of South Africa and the world, making better food choices and eating low carb – it doesn’t need to cost you much and can be done on a budget! The heart of this amazing revolution has been that it is from the people, for the people and is embodied in the 7 Day Meal Plan group that offers free community advice to anyone that wants to Bant! 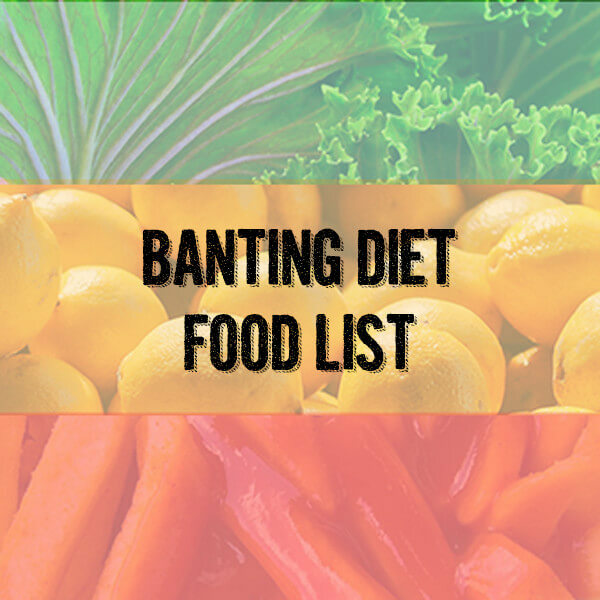 “Banting means going back to eating whole food which is low in carbohydrates preferably all of the time but at least most of the time. If you are doing this, then you are eating mainly from the green list. If that is working for you then nothing needs to be changed. If however your weight loss has stalled or you fail to lose weight, then perhaps you are eating too much dairy which may have a strong insulin response from the whey and casein proteins found in dairy, or perhaps you are eating baked goods made from nut flours too frequently. In that case, the new lists lists may be helpful. Our hope with this lifestyle is that people will educate and empower themselves using the abundance of information that is out there, and, by listening to their bodies, make decisions for themselves. The Noakes Foundation regularly publishes and shares information on their website and social media channels – follow the pages to stay up to date and informed on the latest LCHF news. The new Banting Pocket Guide which was co-authored by Prof Noakes will be released in January 2017 – this Pocket Guide contains great lists which have been vetted and approved by Prof Noakes.